As automotive technology increases, and the complexity of their inner workings become more complicated, there are a shrinking number of operations that the owner is encouraged to perform herself. They are: refueling, adding wiper fluid, and changing a flat tire. Changing a flat tire is the most challenging of these three operations, but it is easy. If you have never tried it before, I encourage you to give it a shot. Sure, your cell phone provider probably offers roadside assistance for $13 dollars a month, but changing your own tire is quicker, and far more satisfying than calling someone else to do it for you. It will make you a more confident driver and passenger, and it is free, kind of. The first step is the hardest. Getting a flat tire. Try to run over a nail, screw or hex wrench. This will pierce the rubber tire and allow all the air to leak out. I've only heard a tire pop one time in my life. It was louder than a gunshot, closer to the sound of a bomb going off. Depending on the circumstances, you will probably be able to continue driving for a few hundred feet as your flattening tire gets louder and louder on the road. Try to pull off of the road, away from moving traffic. 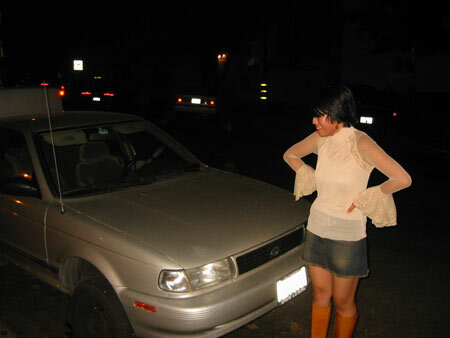 You'll need some room to crouch next to the car too. If there is no room, and you are in danger of getting hit by another car, you shouldn't try to change the tire. Also, if the flat tire is sitting in dirt, your emergency jack might not be stable enough to lift the car safely. If the situation is dangerous, I recommend a tow truck. There is a pretty good chance that the situation won't be ideal. Perhaps the car will be halfway in a gutter, or the road will be wet, or you will have a crying baby in the carseat. Perhaps you will be in a dark tunnel being chased by zombies. I recommend changing the tire yourself in all of these situations. Even if you are completely away from traffic, I recommend walking up the road and lighting a road flare. Road flares are really cool, and this is one of the only situations where you are encouraged to use them. Place them 100 steps upstream from where your car is, to give oncoming traffic an alert that you are a badass, changing your own tire on the side of the road. While you are walking on the side of the road, take a quick look at the roadway to see if there are any more nails or screws in the road. Sometimes a whole box of nails falls off of Mr. Pirelli's truck. You might be able to save other people from the fate you are suffering. 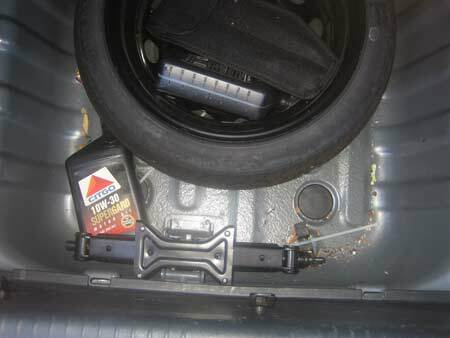 The next thing to do is to locate the jack and the spare tire in your car. 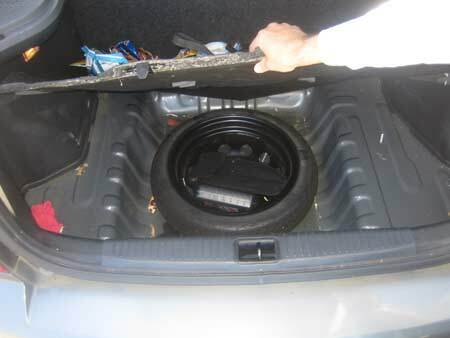 Even if you have never seen the spare tire before, you probably have one hidden in your car. (No one stole your spare tire. 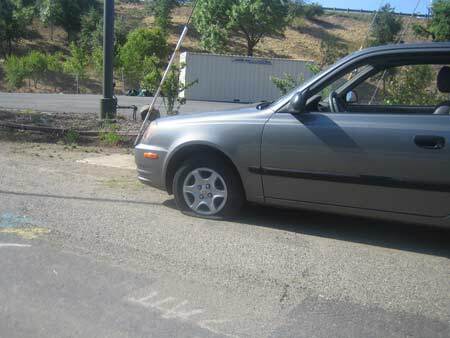 Your spare tire isn't worth much because every car has one already). If you have a trunk, there is probably a false bottom and a compartment below that. 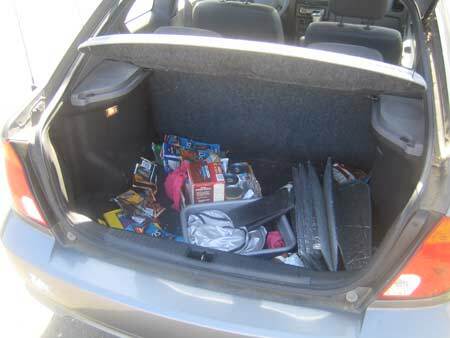 The bad news is that you will have to remove all the crap from your trunk to get into it. Also, you might find Jessica's secret stash of Crown Royal. Please continue reading page 2 of Easy, Illustrated Instructions on How to Fix a Flat Tire.